Cydney Snyder is a senior at Southern Methodist University pursuing bachelor’s degrees in Human Rights, Public Policy, and Political Science. She is also a Cornerstone Scholar, a Engaged Learning fellow, and a member of SMU’s honors program. Cydney is from Celina, Texas – a small, rural community, an hour outside of Dallas. While she has worked on education research projects throughout her time at SMU, Cydney became passionate about STEM education after watching her brother struggle through the college application process. She is currently developing a STEM camp for rural communities, using place-based pedagogy. Cydney hopes that this camp provides students in rural communities more exposure to STEM as well as educates students on the applications of STEM in their everyday communities. Outside of the of the Hunt Institute, Cydney can be founding in many leadership positions on campus. 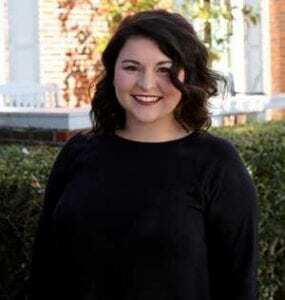 She serves as the treasurer of the SMU Human Rights Council, and is the Vice President of Philanthropy for Alpha Chi Omega, and served as an Orientation Leader this past summer. Cydney plans to go to graduate school for education policy, and hopes to one day focus on rural education policy.